A fatal irony is one of the major facts of life in the narratively repetitious world of High Sierra where a lot of things tend to happen more than once: repeated motions, returns to the same place, actions or characters which anticipate one another with a sense of accumulating fatality and mortality. Pa Goodhue dodges a jackrabbit on the road to California and almost runs Roy Earle into the desert; Roy happens upon the scene of a wreck in which the Goodhues have been involved; not much later, Babe, Red, and Mendoza fly off the highway after taking “the wrong road,” an error which has an almost Hawksian capacity to suggest the potential deadliness of incompetence in a tight spot. Roy returns to the house where the Goodhues are staying, once with Doc Banton to see about fixing Velma’s foot, again to ask Velma to marry him, and finally to “see her walk.” He makes two trips to Shaw’s Camp, and cases the setup at Mendoza’s hotel before coming back with Babe and Red to pull the job. The circularity of the film’s narrative geography says something about the illusion of freedom in itself, but entrapment becomes a major concern on other levels as well. There is a shot in the final chase sequence that might go unnoticed amid all that sped-up frenzy of automobiles careening along narrow mountain roads, but which describes an important and in a way cumulative motion. We see Roy’s car screech around a curve, spitting dust, then climbing higher up the slope. The camera swings with him as he disappears into the distance, and then it drops to pick up the police cars and motorcycles climbing up the leg of switchback Roy has just left. They move towards the camera, to the jut in the road, turn, and speed off after Earle. We’ve come full circle from the first camera position (actually more than that), thus creating a link between the cops’ cars and Roy’s car which anticipates by a few years the opening of White Heat when the same fluid swing joins the car carrying Cody Jarrett’s gang and the train they are about to hold up. But the moment from High Sierra has another level of significance; the circular motion is one not only of integration but of entrapment and dead-endness, containing everyone and everything on the same wheel of movement and thus mitigating the distinctions—spatial and otherwise—which might serve not only to keep them physically separate but to maintain some ideological boundary between the different things they represent. Hence, Kranmer is both cop and gangster; he’s in Chicago at the beginning of the movie and he’s in California when Roy arrives to see Big Mac after the robbery. Earle travels in a vicious circle from gangsterdom to prison to ten-most-wanted list. Velma’s physical imperfection is repaired, only to be replaced by a childish compulsion to “have fun” and marry some shyster from back in Indiana. The mountain Roy sees as the hallmark of his freedom at the outset becomes the site of his fatal “crash-out” at the end. That circular camera motion may even suggest a larger universe of spiraling mobility by recalling the “motion of the earth” Roy talked about in the scene at Brown’s Auto Court; the earth is “like a little ball turning in the night and we’re all hanging onto it.” Later, Roy and Marie will pull into none other than the Circle Auto Court where, in contrast to the illusory (both cinematically and narrative-wise) security of Brown’s, there is an unadorned location scene in which the disguises that mask reality no longer exist, leaving Roy Earle vulnerable to discovery by the tourist camp operator. There are other walls. In the sequence following the fight between Babe and Red, Marie decides to stay in Roy’s cabin for the night. It’s late, and Marie hears Roy talking to himself in the bedroom; she goes in to find him squirming and tossing and mumbling about prison, walls, and crashing out. Whether Walsh simply wanted to get another point of view which would include both Roy and Marie in the same frame (other than the shot which essentially gazes over Marie’s shoulder and into the room) I’m not sure, but he makes a cut to a very strange camera position which, considering the geography of the room, would be inside the wall against which Roy’s bed is placed. We now see him in a slightly out-of-focus closeup, tossing and turning; past him, Marie stands in the doorway. The uneasiness we might feel derives in part from a sense of spatial disorientation—how did the camera get there?—which in a way reflects the turmoil of Roy’s nightmare. But the shot also makes sense in terms of what Roy is dreaming about: crashing out, being free, getting rid of the walls that confined him for eight years. Because it’s possible only as a part of the cinematic illusion (and hence “unreal”), the physically unexplainable camera position suggests that Roy’s greatest hope—crashing out of both the real prison and the societal ,prison in which he’s still trapped—entails a freedom it is ultimately impossible for him to achieve. The scene at Brown’s Auto Court is another, and more obvious, instance of a moment whose reality is defined precisely in terms of a cinematic illusion of place. Walsh, while blatantly creating an unreal atmosphere, persists in giving it a validity of its own, making it “real” within itself ; while Roy and Velma stare at the cardboard sky and electrically flickering stars, we see behind them the silhouette of Ma Goodhue as she stands in the kitchen washing dishes. The pretension of insisting, through attention to such details, on the believability of the scene is both absurd and sublimely poetic. And it is closely tied to the image of the world which Roy conjures as they stand together at the fence. His simpleminded and yet metaphysically disturbing model of our tenuously balanced position in a wildly spinning cosmos is perhaps no more “real” than the image of the real “place” Walsh has created, and yet they are both equally true interpretations of reality which suggest a dimension to the world of High Sierra based not on the literally realistic value of the visual data we receive, but on the suggestive potential of illusion and myth. We never do see the actual machine gun that Mendoza brings to Camp Shaw for Roy to use at the holdup. Its reality is confined to the story about Lefty Jackson and to whatever intimations of an encroaching mortality we might glean from the sound of Bogart tapping his fingers on the case as though knocking against the hollowness of a coffin. Later, in the final scenes, we see only a spray of bullets that comes from behind a rock Roy is using as a cover, and it’s almost as if the bullets are coming from the rock, from a fragment of Roy’s own mythic identity. Story and reality so often become mixed in High Sierra that it’s hard to separate the two; Velma thinks Roy must be about the best man that ever lived “because Pa says he is”; Kranmer’s girl has “sure heard a lot about” Roy Earle and is perversely eager to lay her eyes on the real article; Pard has a history of bad luck (according to Algernon) that is taken out of the realm of hearsay and made startlingly immediate when Walsh cuts from the scene in Roy’s car where Doc Banton talks about how Johnny Dillinger used to say men like Mac and Roy were “just rushin’ toward death,” to a shot of Pard who hears Roy’s car driving up and goes rushing over to meet him. On the other hand, the chasm between myth and man is circumvented by Marie, who establishes an instant rapport with Roy and is calling Goodhue “Pa” within five minutes of their meeting. The logic of her familiarity is sound: Pa Goodhue is part of Roy Earle in the same way that Mac is cut from the same mythic block as Roy. Marie never meets Big Mac, but she accompanies the man who carries the inevitability of Mac’s mortality in his own bullet wound. The triangularity (Roy–Mac–Pa) is crucial. Mac and Pa are almost diametrically opposed representatives of two different ways of life, yet they’re remarkably similar in their down-to-earth sensibilities and their common linkage to pasts that are slipping away from under them. The double identity of Roy Earle—mythic gangster and smalltown innocent—is manifested in their presences; Big Mac is the dying holdover from the old days in the underworld, and Pa Goodhue is the paternal symbol of back home who can say without irony that Roy understands him because “me and Roy’s old-timers.” Big Mac is an “old-timer,” too, but Pa’s world is as far from that gangster realm as the honkytonk origins of Marie—who asks Roy what racket the Goodhues are in—are from Pa’s homespun beginnings. We first see Mac in a bed behind a newspaper he’s holding in front of his face. Figuratively and literally, he exists “behind” the mythic aura which society, via the news media, has thrown up around him. In a sense, Mac and Roy are that mythic creation, and their mortality is as tenuous as that of the old order which is dying off around them. Big Mac dies in his sleep during the time it takes Kranmer to go out and let Roy Earle into the apartment. Kranmer then fills Roy with the seed of his impending mortality, the bullet wound that flairs into visibility when Roy and Marie argue about Pard’s bad-luck-bringing and Roy jokes about the reward money Marie could collect if she turned him in. When Marie tells him not to joke about “that kind of thing”—that life-and-death kind of thing—Roy brushes it off with a gesture retrospectively as chilling as Mac’s earlier insight into his and our mortality: “I’m going to die, so are you, so are we all.” Roy begins to sound like Big Mac, he’s in the same position as Big Mac (lying on a bed), he’s one of the last survivors of Big Mac’s world. Roy, Earle. Two first names. Two pasts. Two identities. If names are at all important in High Sierra, the allusive direction of “Goodhue” points towards a region of moral security and life-giving value. And yet there is a double edge to Roy’s relationship with the Goodhues, a family that seems to reflect at least one side of Roy’s dual character. The Goodhues represent some lost world back home which Roy doesn’t want to lose contact with, but at the same time, there is nothing really life-giving he can derive from them beyond a self-indulgent satisfaction in “fixing up” Velma’s foot as though repairing a commodity to some form of operable efficiency. Because she has a boyfriend already, Velma only shuns Roy when he asks her to marry him. One of the nicest and perhaps most unnoticeable details in the movie is the way Velma quickly hides something under bedcovers when Roy walks into the room and leaves it there so that we never really do get an out-and-out explanation of what it was, although from what we learn during the course of the scene we can pretty safely surmise that it was a letter from Mr. Preiser, Velma’s beau. When Roy comes back again, Velma introduces him to her partying friends and to that same Mr. Preiser, of whom she can only say, “He’s my … well, he’s from back home.” The phrase is cruelly equivocal: “back home” is the same place that Roy Earle is excluded from forever; it is the root of the same sense of moral good that men like Pa Goodhue represent; it is the farm he remembers, the farm whose image is destroyed by the new owner who sees Roy only as the man on page one of the newspaper, the bankrobber just released from prison. There are the Roy Earle we see and the Roy Earle we hear about, and we often experience both simultaneously, levels of a mythic bygone era superimposed on the present reality of the living man. 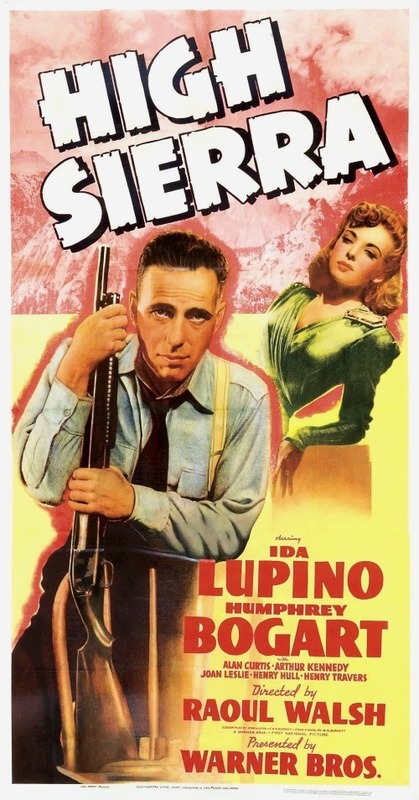 Huston’s High Sierra screenplay provides a view of the Bogart character which is rooted not only in the mythic past of gangster glory when men like Big Mac and Roy Earle were in their prime, but also in a more personal past when times were good and the farm was a world in itself and life was full of men like Pa Goodhue. 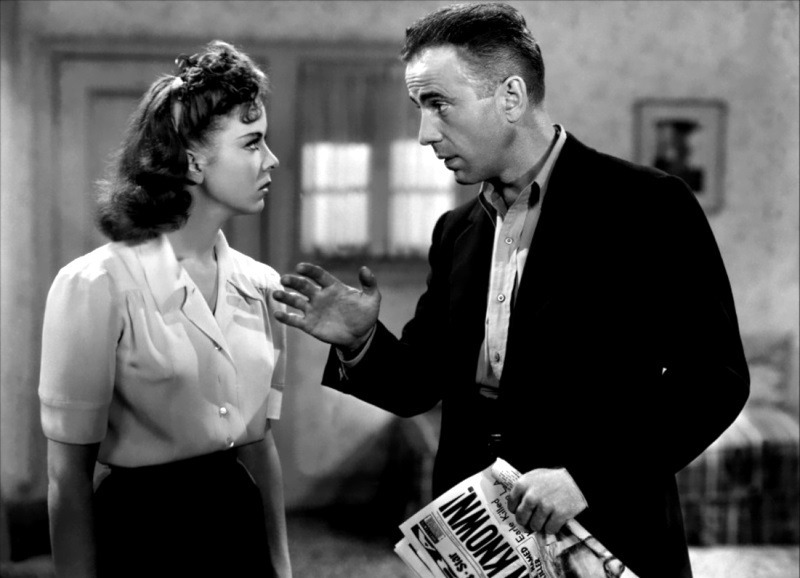 But through an odd juxtaposition of constricting irony and Huston’s preoccupation with roots, Roy Earle is often seen through the eyes of smalltown types, “back home” people, and they’re the ones who are constantly posing threats to his life by recognizing him as the mythic badman. The only people who pose no threat to Roy Earle are those who know nothing of his identity. Early in the film, the man in the gas station below Mt. Whitney talks and asks a lot of questions, but simply out of loneliness; he’s “safe” because he’s not in on the knowledge everyone else seems to carry. Later, after Roy has put Marie on the bus, he goes into a drugstore and proceeds to hold it up. The storekeeper (played by Harry Hayden, who even looks a bit like Spencer Charters, the gas station operator) momentarily exhibits the same good sense and healthy ignorance, until a cop happens through the door. The storekeeper’s warning to “Look out, Tom, it’s Roy Earle!” comes in an instantaneous burst of pent-up, sensationalism-imbued awe at confronting the one man the whole world’s after. Everyone knows Roy Earle, and the way the myth pervades the world of High Sierra is reflected in the very reverberations of defiance and threat which echo from the stone faces of the mountains in which Roy makes his last stand. Marie, riding on a bus in the other direction, seemingly by chance hears the news of Roy over a station loudspeaker. But it’s really not so much by chance as it appears: Roy’s story is being broadcast everywhere, and wherever Marie might happen to be she would hear it or read about it. The world of walls and the halting montage of shots needed to penetrate layers of confinement has been replaced by a world of unencumbered space and an eerie sense of integration that seems confusing and disorienting. Just before he falls from that precariously held bastion of isolated greatness, we see an image of the humanly vulnerable Roy Earle squatting in his rocky nook smoking a last cigarette; on the soundtrack there is the mercilessly lurid voice of the news commentator, a voice which perpetuates the myth to the very end and which seems to emanate from the very stones surrounding Humphrey Bogart. Direction: Raoul Walsh. Screenplay: John Huston and W.R. Burnett, after Burnett’s novel. Cinematography: Tony Gaudio. Music: Adolph Deutsch. 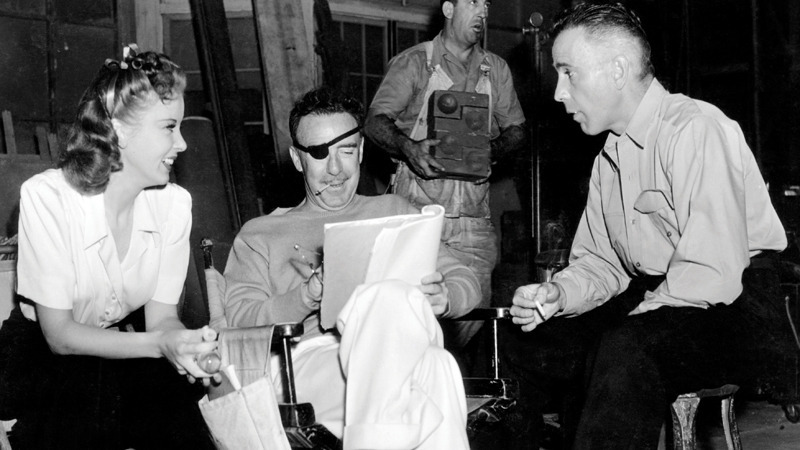 Production: Hal B. Wallis (executive), Mark Hellinger (associate). Warner Bros. The Players: Humphrey Bogart (Roy Earle), Ida Lupino (Marie Garson), Arthur Kennedy (Red), Alan Curtis (Babe), Joan Leslie (Velma), Henry Travers (Pa Goodhue), Henry Hull (“Doc” Banton), Donald MacBride (Big Mac), Barton MacLane (Kranmer), Jerome Cowan (Healy the newsman), Cornel Wilde (Mendoza), Willie Best (Algernon), Elizabeth Risdon (Ma Goodhue), Minna Gombell (Mrs. Baughman), John Eldredge (Lon Preiser), Spencer Charters (Ed, gas station operator).